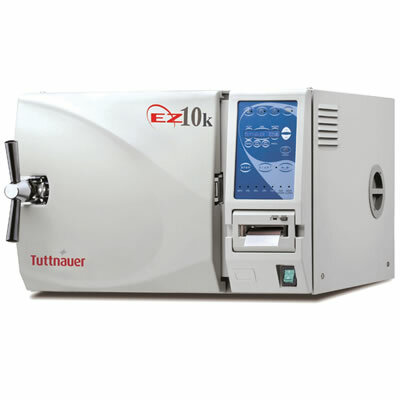 Tuttnauer USA Fully Automatic Autoclaves | Tuttnauer Usa Co. Ltd.
With over 80 years of experience, Tuttnauer is among the best providers of sterilization and infection control products. The EZ Series of fully automatic tabletop autoclaves offer 1-touch design that fill, sterilize, exhaust, and dry at the touch of a button. A closed-door drying system features Hepa filtered air which is circulated in the chamber during drying. This system better maintains sterility and ensures efficient drying, making these Models among the best in the market. The EZ series is available in a 9' chamber (EZ9) and a 10' chamber (EZ10). The EZ10 comes with 4 full size trays and the exceptionally deep chamber can accommodate 6 standard cassettes (3 full and 3 half). The EZ series is also available in a quick cycle model, the Kwiklave (EZ10k). EZ autoclaves are backed by a two-year parts and labor warranty.